Who loves paper straws?!! 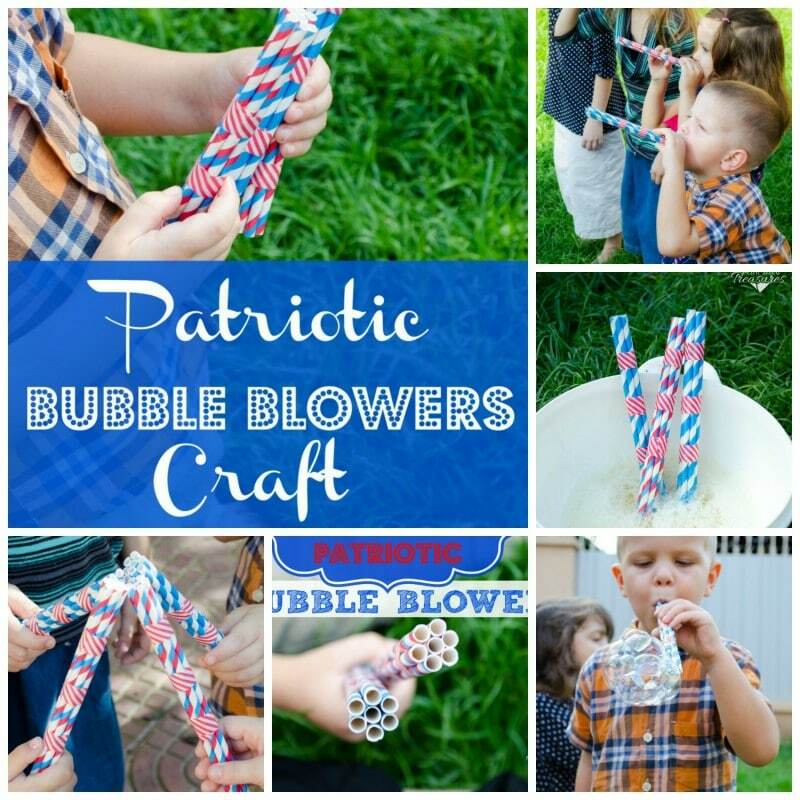 These Patriotic Bubble Blowers are the perfect way to help your child celebrate any American, patriotic holiday!. With just a few materials, you and your kids can whip up this craft in a matter of minutes. No fuss, no sweat crafts are exactly what busy moms need! I love paper straws. They’re cute and come in so many styles and colors. My kids love them too. We definitely have quite a few in our pantry! 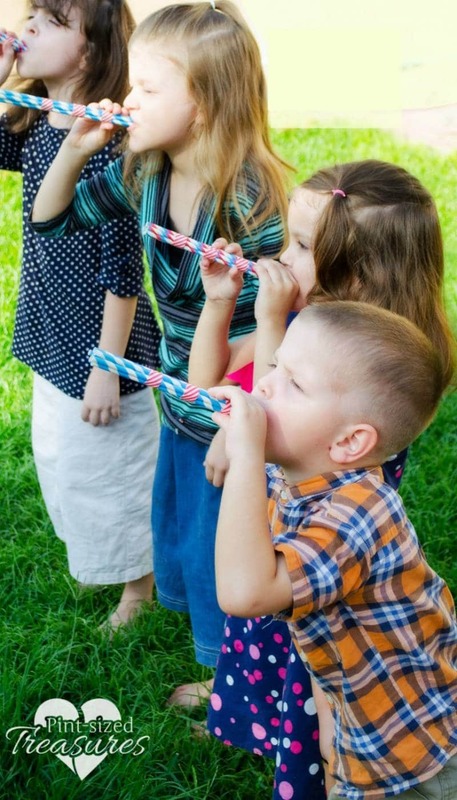 As I was brainstorming about some fun crafts to keep us busy this summer, I thought about creating some bubble wands or blowers made from straws. 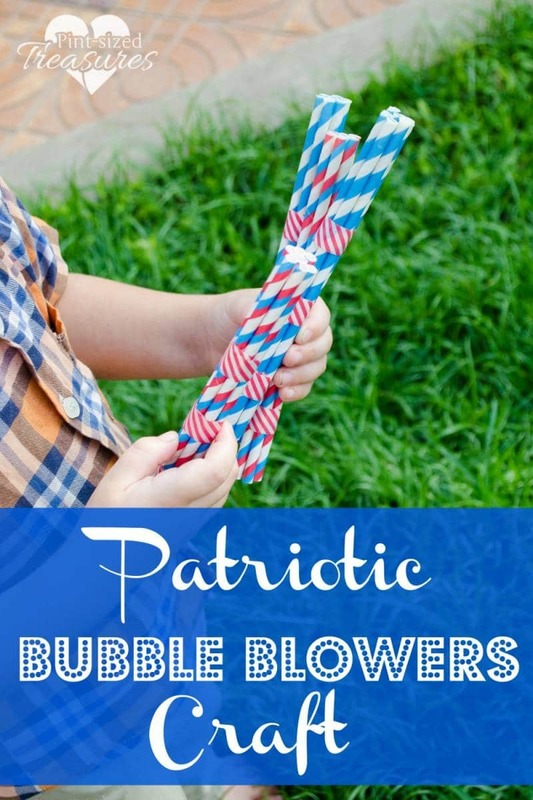 Changing out the colors and styles created some fun bubble blowers that resemble firecrackers — thus, the perfect patriotic craft was born. We also made our own home-made bubbles recipe that kept the kids busy with a bubble solution for hours! It’s simple and easy. You probably have all the ingredients in your kitchen pantry this second! 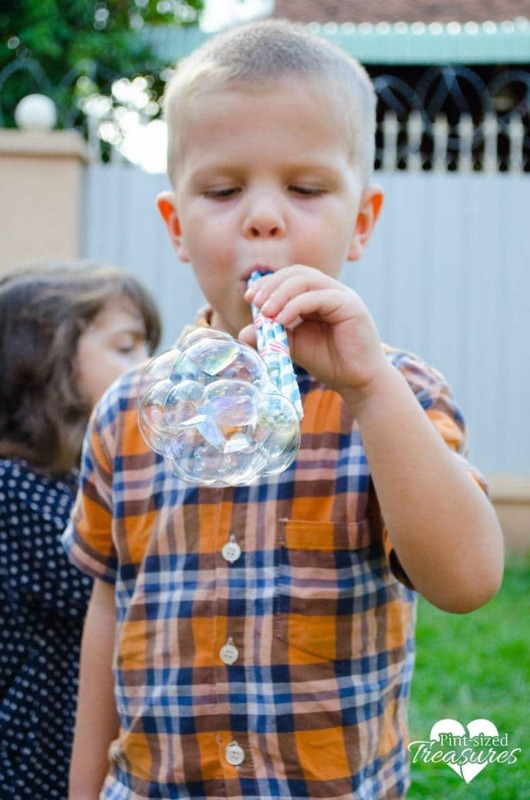 And if you want to make GIANT bubbles, check out this giant bubble recipe. My kids were loving this craft. Once the bubble blowing started, it was hard to stop! These are also super easy to craft. As I started constructing the first two, my four-year-old grabbed up supplies and started making her own without any instructions. In no time she had constructed her very own bubble-blower and was ready to try it out! Not to mention, she was feeling pretty smart that she did it all by herself. I got to explain to my preschoolers that red, white and blue were colors that represented our country. After explaining the colors, I easily rambled on about the American flag, the national anthem and other special events that surrounded the birthday of our great country. Yes, that was a very special day and we should continue to celebrate it with our kiddos! 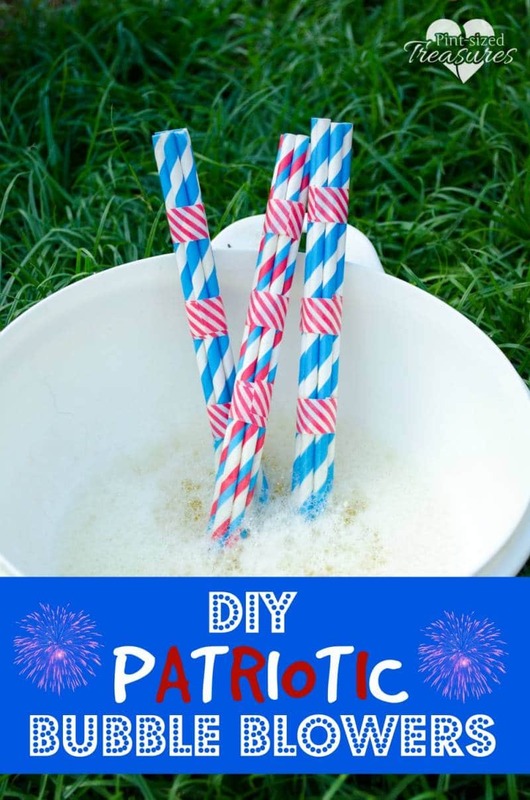 I imagine that more red, white and blue crafts are headed your way! 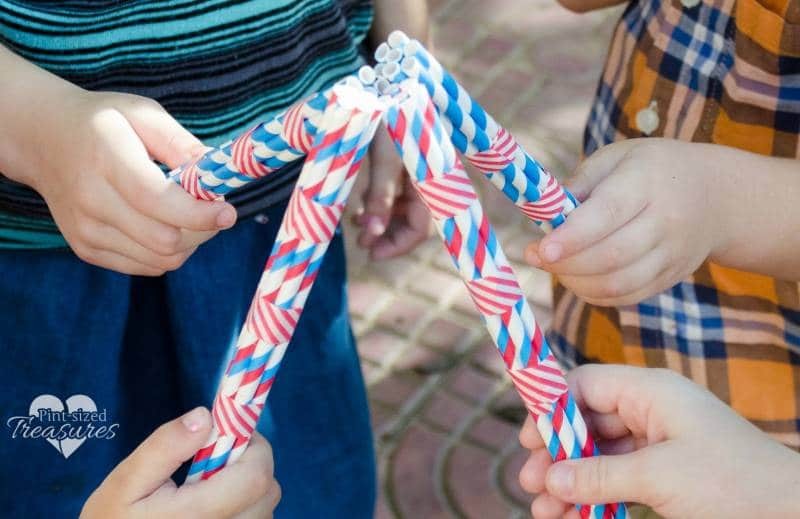 Take seven straws and group together in a pentagon shape. Place strips of washi-tape tape about 2 cms apart each other — one strip near the top, and one strip near the bottom. Tape securely, but leave about one inch on the bottom free from tape. If you tape the blowers all the way to the bottom, the tape will get wet when the kids dip the blower into the bubble solution and fall off. Caution: Do not let the paper blowers sit in the bubble solution. Only dip and then blow the bubbles. Paper straws can become a soggy mess if left in the bubble solution too long. Mix all ingredients in large container or bowl and stir. Now, your bubble solution is ready for dipping! The longer it sits, the more bubbly it becomes! 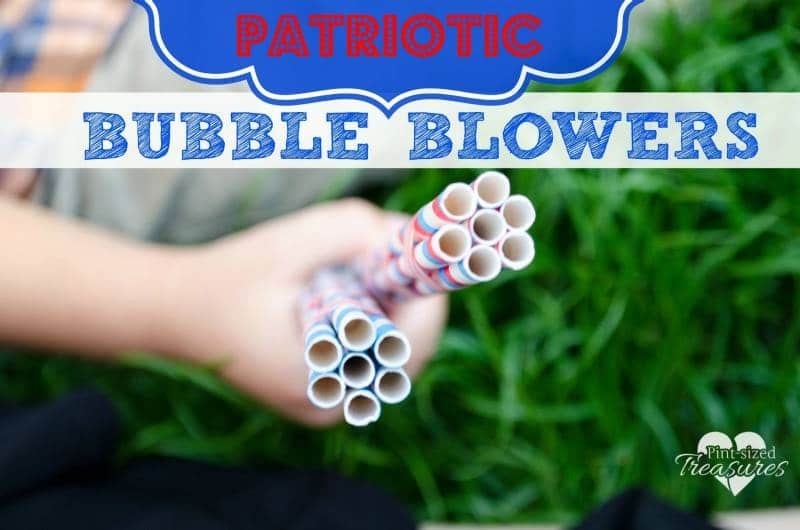 Enjoy your patriotic bubble blowers and be sure to share this craft with your friends! When you make your own bubble blowers place your photo on our wall on Facebook! We would love to see your crafts!